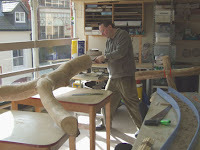 Picture left shows:- Simon(artist in charge off this section of project) working on the slot for the top part to be attached. Picture right :- You can just make out the top part of the wooden man. Also on the table , are two parts of a water Channel that has just had some mosaic put into it. 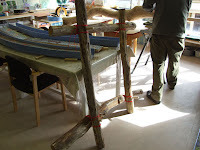 This will become a water feature which the kids from the nursery can float wooden boats down it. on clear perspex acrylic boards, which when heated up can be shaped into the design that is required of them. The idea behind these is to form flower borders, and with the panels being clear will give the children at the Nursery off what goes on/moves around/lives inside the soil . Picture above :- is just one of many moasic`s that need to be done. I did this one, which will be turned into a stepping stone, its just awaiting to be set into concrete. 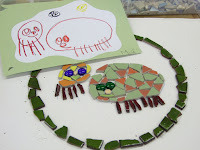 The designs as you can see are copied from drawings that chidren from the nursery have done.